Co. Waterford: Aglish (2), Ardmore (3), Ballylaneen (2), Clashmore (2), Colligan, Dungarvan (8), East Modeligo, Fews, Grange, Kilgobnet, Kilrossenty (2), Kinsalebeg, Seskinane, Stradbally (2), Whitechurch (2). The Board also included 10 ex-officio Guardians, making a total of 40. The population falling within the union at the 1831 census had been 57,634 ranging from East Modeligo (population 592) to Dungarvan itself (16,028). 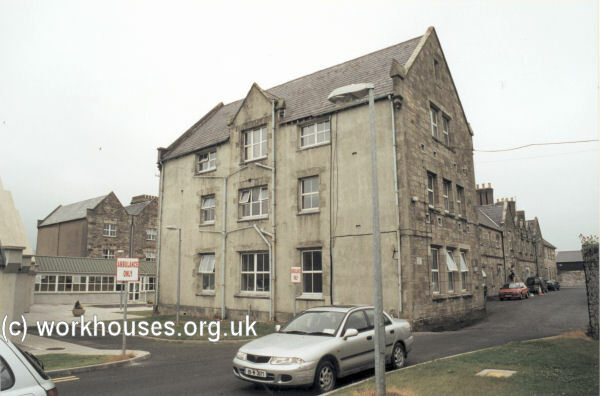 The new workhouse, built in 1840-42, occupied a 5-acre at the Spring, to the west of the town, on land leased from the Duke of Devonshire at £24-13s. per annum. The building was to accommodate 600 inmates. Its construction cost £6,480 plus £1,600 for fixtures and fittings etc. It was declared fit for the admission of paupers on 27th December 1841 but did not admit its first inmates until 4th July, 1844. The workhouse building followed one of the standard designs by the Poor Law Commission's architect George Wilkinson, with a two-storey entrance block at the front containing Guardians' board-room, clerk's office, probationary, vagrant and refractory wards. The entrance block was later extended at each side. 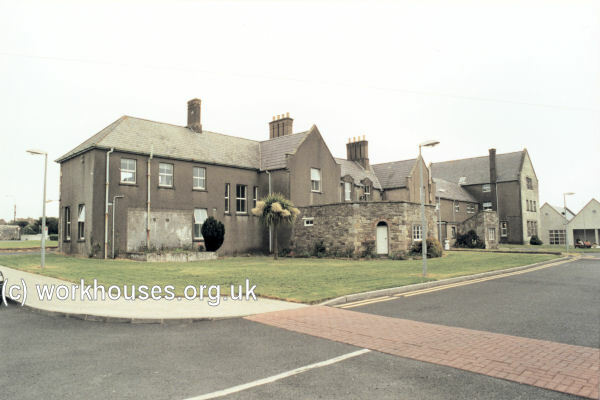 Dungarvan workhouse site entrance from the north, 2000. Dungarvan entrance block from the north, 2000. Behind the entrance block stood the long main block, two-storey for most of its length with three-storey blocks at each end. The central part contained the Master and Matron's accommodation with the boys' schoolrooms to the west and girls' to the east. Above the schoolrooms were the children's dormitories. The end blocks contained wards for the old and infirm. 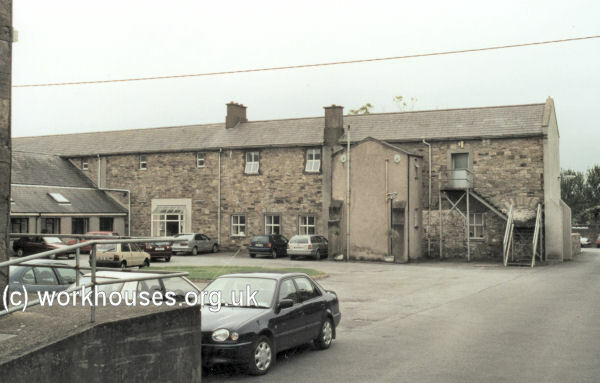 Dungarvan workhouse main block, 2000. To the rear were kitchens and wash-houses, then a single-storey spine containing dining-hall and chapel led to the infirmary block and idiot wards. A separate fever hospital was later erected at the north-east of the workhouse site. 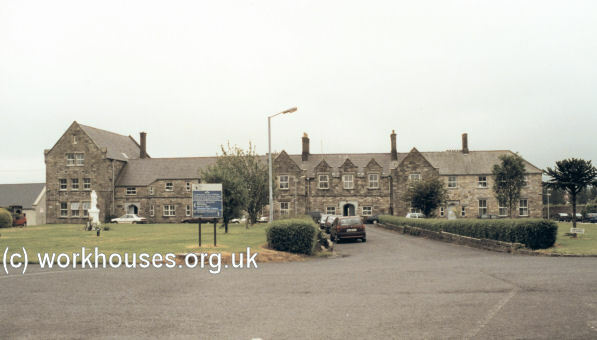 Dungarvan fever hospital block from the west, 2000. Dungarvan, which was in a noted potato-growing area, suffered greatly during the famine years 1845-50. Following severe rises in food prices, the Dungarvan Relief Committee was established in January 1846, with the aim of distributing Indian-meal at subsidized prices. On 28th September 1846, the scarcity and price of food, and the shortage of work, resulted in the Dungarvan riots where grain stores on Dungarvan Quay were looted. Pressure on the workhouse steadily increased, which had 650 inmates by 19th December 1846, rising to 739 by January 1st, and 766 by January 16th. Diseases such as typhus fever and dysentery were widespread. Attempt were made to reduce numbers by giving out-relief to the healthier inmates. A number of auxiliary workhouse buildings were set up. Government-sponsored soup-kitchens were set up during the first half of 1847, but the scheme ended in July. A few public-works schemes were also instigated. However, things got worse throughout 1847. What relief measures were proposed were hampered by lack of funds — rate-collectors found it very difficult to collect rates, and in some instances needed police protection. The misery continued through 1848 and into 1849. At the start of January 1849, the total number of workhouse inmates stood at 2,751 and rose to over 3,000 by the end of that month. At the start of February, the situation was compounded by the first cases of a cholera epidemic that would last for several months. A stark reminder of the scale of the deaths during the famine years comes in the shape of the famine graveyards in which famine victims were buried in unmarked graves. From the end of 1847, the dead from Dungarvan workhouse went to the Slievegrine graveyard at Pulla. Prior to this, the old graveyard at Kilrush was used. 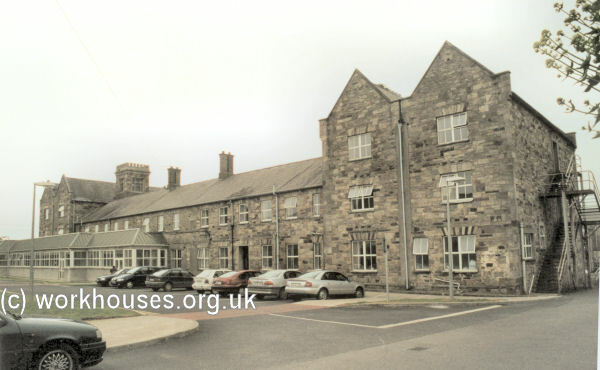 Many of the original workhouse buildings survive in the shape of the present-day St Joseph's Hospital. Part of the entrance block is used as the local Register Office. Waterford County Archive Service, Dungarvan Central Library, Davitt's Quay, Dungarvan, Co. Waterford. Holdings include Board of Guardians' minutes (November 1845-1922) etc. Detailed description of surviving records. 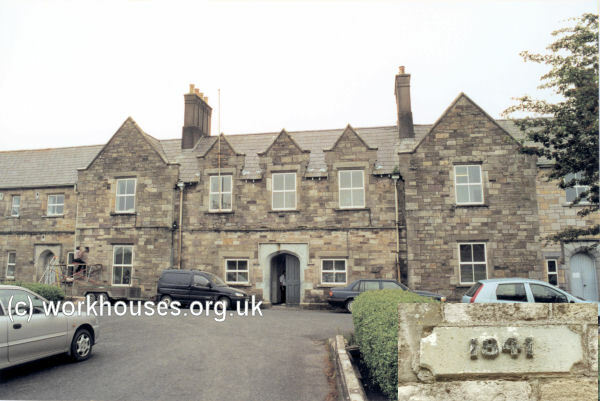 Dungarvan Museum web site has many pages about the history of West Waterford including the local workhouse.